DUBLIN – JANUARY 15, 2018 – Aqua Comms DAC (“Aqua Comms”), the operator of Ireland’s first dedicated subsea fibre-optic network interconnecting New York, Dublin and London, announces today its plans for continued investment in submarine cable infrastructure having joined the HAVFRUE consortium which will own and operate a new subsea cable system connecting New Jersey, U.S.A., to Ireland, and Denmark, with connectivity options to Norway. 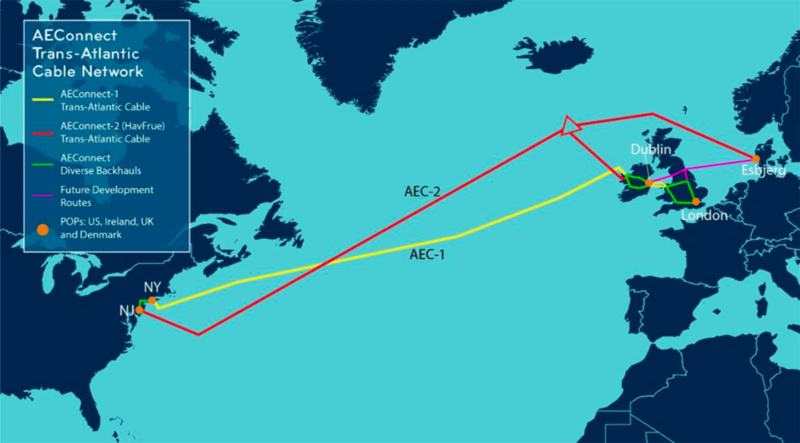 Aqua Comms will market and sell capacity services and raw spectrum on its portion of the HAVFRUE cable system under the brand name America Europe Connect-2 (AEC-2) as complementary to its existing transatlantic cable, America Europe Connect-1 (AEC-1), running between New York and Killala in County Mayo, Ireland. Aqua Comms is also concluding a new cable route to Denmark through the UK, developing CeltixConnect-2, which connects Dublin to Manchester, as well as the North Sea Connect cable that will link Stellium’s data centre in Newcastle, England, to Esbjerg, Denmark. The HAVFRUE / AEC-2 infrastructure network services will be delivered to and from modern, high-reliability, carrier-neutral interconnection points at NJFX, in Wall, New Jersey, and 1025Connect in Long Island, New York, with a resilient network connection in between, offering a Manhattan bypass route increasing diversity and resiliency in the region. In Europe, the services will be offered from all landing stations and carrier-neutral, metro area Points of Presence (PoPs) in Dublin, London, Amsterdam, and Esbjerg, where the system will more than double fibre connectivity to Denmark, increasing the diversity and reliability of the Internet to the region. The Aqua Comms team is attending PTC’18, taking place January 21-24, in Honolulu, Hawaii, Metro Connect, January 29-31, in Miami, Florida, and Submarine Networks Europe, February 20-21, in London. Aqua Comms invites companies to meet with its representatives at these events so that it can assist organizations with their long-term connectivity needs across the Atlantic Ocean. To learn more about Aqua Comms, visit www.aquacomms.com.